Gobble Gobble. It's time for Turkey week. On each of my free lesson planning pages you can find a free sample lesson plan, Pre-K Printable Fun products related to the theme, suggestions for your Dramatic Play/Construction centers, book selections, inspiration from our FB Community and recommended activities from around the web. *Activities marked with an asterisk are Pre-K Printable Fun products, the other activities are linked up below! 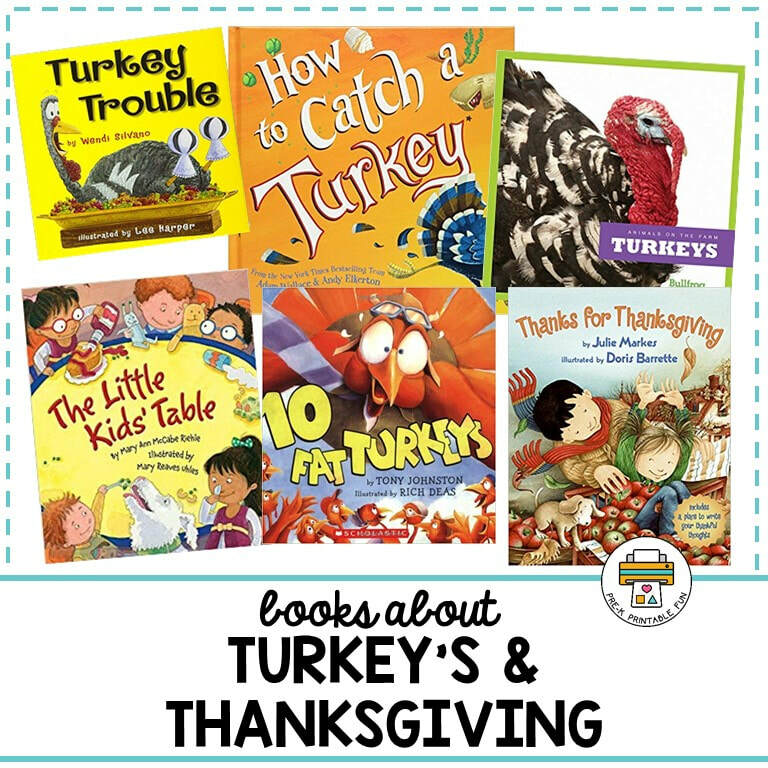 See how our customers are using our Pre-K Printable Turkey & Thanksgiving products! Get Ready for your Thanksgiving Feast! Add some pretend Thanksgiving Day Food items to your Dramatic Play Space. Pretend You can add a box of Thanksgiving Holiday Decor to your space, include: Thanksgiving tablecloths, cloth napkins, place mats for making the table "Extra" special and Thanksgiving decorations. Allow the children to decorate their space for their Thanksgiving Meal. A table setting mat, and play food printable can be found inside my Turkey & Thanksgiving Activity pack. Add dress up clothes and luggage-as many children may be traveling during this time. This is a great time to add extra photos of families as well. Encourage your kids to make their own Turkey costumes, There are several fun links to "Turkey Headbands" on-line. Use brown paper bags to make vests, and add feathers for some flair. Add plush Turkeys to your space. Adorable Turkey Costume shared by Lisa N.
Don't forget the dessert! Use my Dramatic Play Pie Stand Set to create pumpkin pies for your space, or set up a Pie Stand! This digital pack is available in the Pre-K Printables Club Member Area, and is also available for purchase in my shop. Get a closer look at this pack in use! Bring out the Farm sets, and let the kiddos practice their hand at running a turkey farm. You can transform your Farm Set into a Turkey farm by making your own Turkey Blocks. Another option is purchasing some small vinyl Turkey finger puppets or Plastic Turkey's to add to your Construction space. Many Children will be Traveling and celebrating Thanksgiving with their extended families. Be sure to add family dolls, Play Houses, Cars and Planes to your Construction Space this week. Consider purchasing Thanksgiving themed play sets to this space this week. Many companies such as Lego, and ﻿Fisher-Price﻿ offer them. You can print your own Free Thanksgiving Pattern Block Mats from This Reading Mama. Another option is adding Lincoln Logs to your Construction Space if you will be discussing the Pilgrims with the Children in your care. Check out this "Thanksgiving in the Village" project from This Little Project for some inspiration. Brown is the Color of the Week. Dye your play dough brown (a few different shades if possible). Add feathers, and google eyes to the Art Space. If you have littles you can pre-cut some construction paper "feathers". Scour the thrift stores for Turkey and other Thanksgiving cookie cutters. Add a variety of different shades of brown construction paper to the Art Space this week. Add Thanksgiving Inspired Cookie Cutters, Stamps, Seasonal Color Paint and Crayons to your Art Space this week. 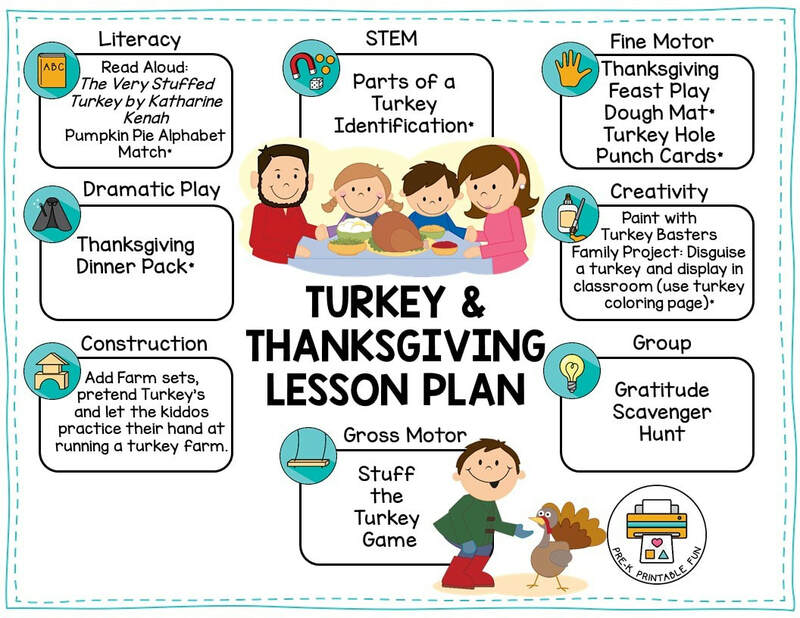 *Identify the parts of a Turkey with these 3 part cards found inside my turkey and Thanksgiving activity pack! This fabulous Thanksgiving Tree belongs to Cathy Meekins of Happy Hands Early Learning Academy. You can see how the kids have added to the tree throughout the week. Thanksgiving is the perfect opportunity talk about what we are thankful for. Create a group "Thanksgiving Tree". Have the children tell you who and what they are Thankful for and write their ideas on leaves to add to the tree. At the end of the week send these leaves home. They will become special memories as the children get older. 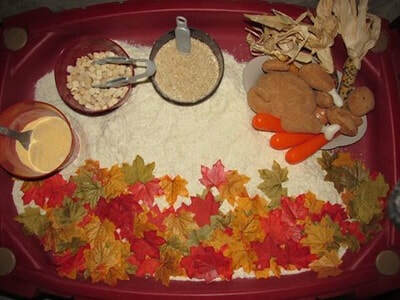 This adorable Thanksgiving Inspired Sensory Bin was Created by Erica Payne of Erica's Educare Learning Center. She used a Potato Flake Base, and added Corn Meal, Brown Rice, and Stuffing in the Buckets. This adorable Turkey play dough invitation was created by Daycare Spaces and Ideas member Erica Payne of Erica's Educare Learning Center. 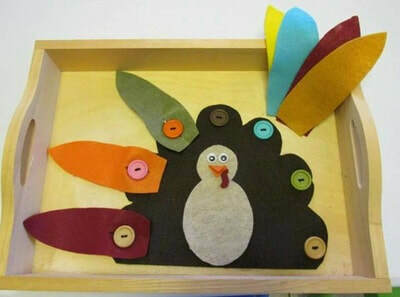 Felt Turkey Fine Motor Activity. Create some Homemade Butter for Science this week. Be sure to check out this great tutorial from Little Bins for Little Hands.